Rotary Handles - direct or door mounted, removable and/or dis-engageable, all versions are padlockable as standard. RECORD MCCBs are available with a comprehensive range of accessories, which have been designed with ease of installation for the user in mind. Shunt trip -trips the circuit breaker for any voltage between 70% and 110% of nominal control voltage. Undervoltage release - opens the circuit breaker when the control voltage falls below 70% Un. 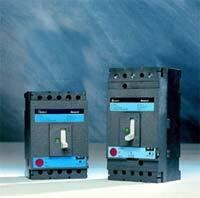 Motor control units - fixed to the front of the circuit breaker. this device enables remote opening and closing of the unit. Locking facility available in the OFF position. Rotary Handles - direct or door mounted, removable and/or dis-engageable, all versions also padlockable as standard. Earth Leakage Units - this device offers personal protection against both isolation, overload and short circuit faults. Manual or Auto-changeover systems- to ensure continuous power supply to a facility with minimum interruption. Rear connections - full range of connections studs for bar or cables with lugs, extenders and connections to improve the cable termination capacity.